Seaside for Two - Ocean Views from Bed! Let the gentle sound of surf lull you to sleep before you wake to another glorious sunrise over the Pacific Ocean. Our seaside studio for two is over the road from incredible Onemana Beach and boasts fantastic views, especially from bed! This is the perfect spot to escape the rat-race, de-stress and unwind, for a few nights. A step up from glamping, you have the use of a cosy, self-contained studio (below owner's home) with ensuite bathroom and sun-soaked deck. There’s a fridge to keep the wine chilled and a jug and toaster for morning coffee and breakfast. Cooking is done outside on the barbeque, adjacent to a bespoke kitchen bench with sink and hot, running water. There are even sea views while you do the dishes! Dine or hang out in the nearby fireplace area, a sheltered sun-trap with another ocean vista. 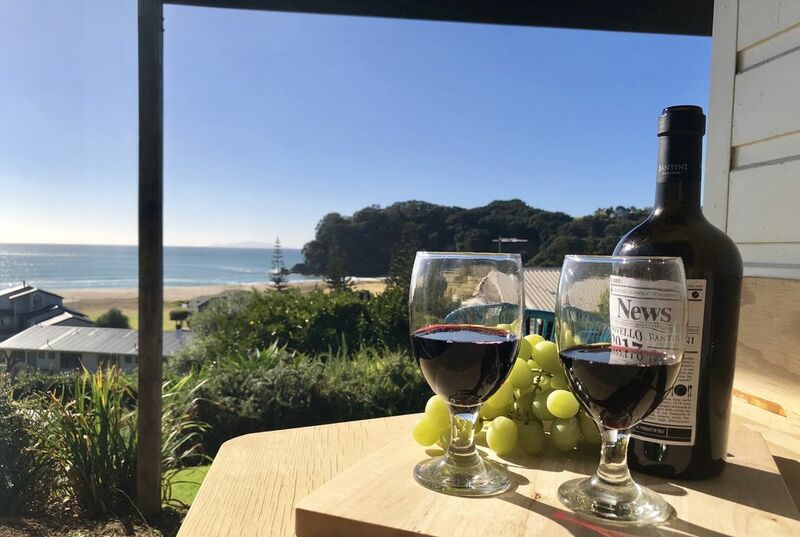 Onemana is a hidden treasure just 10 minutes over the hill from busy Whangamata – so you can stay close to the action, but really leave the world behind. There is so much to 'sea and do' in this area, or you can kick back and enjoy the tranquility. This perfect little pad can only be booked for a minimum 2-night stay. We respectfully ask that you provide own linen, do all dishes and clean unit before leaving. Over the road from the beach. Beach and ocean views from the property. So relaxing and peaceful. We absolutely loved the view. Neat and tidy with everything one needs. Thanks Richard.